Listen to this track by Tubeway Army founder and frontman turned solo synth-rock innovator Gary Numan with this sci-fi tale of a lonely computer. 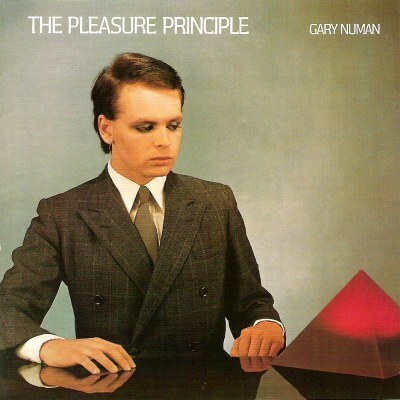 It’s “M.E” as taken from his landmark 1979 album The Pleasure Principle a disc that helped to usher in the 1980s; a mix of synthesizer-based pop mixed with live drumming, and with the odd violin and viola for contrast. Having put out two Tubeway Army albums, Numan eschewed traditional rock instruments (read: guitars) for this, his third release and his first under his own name. Instead, he discovered minimoog and polymoog synthesizers, instruments growing in popularity on the continent as popularized by acts like Kraftwerk, who provided a basis for Numan’s approach . The main argument against synthezisers in the rock world even to this day is their artificial, cold sound. The “strings” don’t sound like strings. The “choirs” don’t sound like choirs. “Vox Humana” is a preset. But, given that Numan’s subject matter was about alienation, technology, and the relationship between the two, the real question is which came first, the songs or the instruments that inspired them? Synthesized music, and the themes of technological ubiquity and mechanized humanity in the music took off in the 1970s, partially due to a trend in industrialization and computer technology emerging in parallel at an alarming rate. This trend affected commerce, mass transportation, communications, and (of course) music and the arts to an exponential degree. But, there were certainly other forces guiding this development, too. The idea of man and machine interface, and the blurry lines between the two were beginning to step out of the world of science fiction, and into real life. And, additional to the technological advances of the time, particularly in emotionally austere Britain and Northern Europe, the idea of cold, emotional distance was a national character trait in many places as it was. You could imagine how a fear of a mechanized and impersonal future could be rich territory for writing songs. This tune is certainly one of those, a story of a machine built by a dead and forgotten humanity, and abandoned on a lonely, silent earth. And this, from a record where many similar thematic angles are explored across its running time; machines with feelings (“Metal”), distance and non-involvement (“Films”, “Observer”), and connections between machines and people as more important than real relationships (“Cars”). The whole album off of which this song comes would make an impact in many ways. First, it would yield a hit single in “Cars”, which would sound like nothing else on mainstream radio in 1979. Second, it would kick off a very successful tour for Numan. Third, with the popularity of “Cars”, the record would help create commercial momentum for an entire subgenre of music just in time for a new decade to start; synth-pop. Numan would be among the first in a legion of fellow Britons to develop synth-pop into the 1980s after he hit with The Pleasure Principle. OMD (who opened for Numan), Depeche Mode, The Human League, Visage, Heaven 17, Ultravox, and other acts would build on this same sound, and around many of the same themes. Later on, Nine Inch Nails would cite Numan as an influence, with the themes of alienation translating yet again to fans of industrial rock, of which Numan himself would also become a purveyor. Numan’s music would be sampled in ’90s pop and dance music, from the Sugababes (“Freak Like Me”), to Armand Van Helden (“Koochy”), to Basement Jaxx (“Where’s Your Head At”). And even rock music wouldn’t leave him unacknowledged, with Marilyn Manson, Dave Grohl, Fear Factory, and others counting themselves among his fans. Gary Numan is an active musician today. Check out Numan.co.uk for music, news, and merch.